(Lanka e News – 10.Oct.2018, 8.00PM) President Gamarala who took his entire brood including his family and families of his family ( family of his prospective daughter in law) to New York for mirth and merriment at state expense , addressing the first public rally following his return from the junket after spending over Rs. 250 million of public funds said , wasting of country’ s funds and corruption should be halted immediately . Gamarala whose bragging and boasting is never ending has during his New York tour distributed a book which is full of eulogies about him .This book containing 67 pages is eight and half inches long and 6 inches broad, printed on thick glossy expensive paper and in color does not mention the name of the author or the publisher. It is mentioned in tiny alphabets in a corner ‘ printed by ANCL’ (Associated newspapers of Ceylon Ltd.) . A number of copies of this book with an unknown author were taken from here to New York conference for distribution among the foreigners who attended the conference. Full 37 pages of the book of 67 pages carry color photographs of Gamarala. The book which gives details about president’s life and his so called accomplishments until he became president is all flatulence and no substance. A large number of copies of this Gamarala’s book exclusively glorifying and aggrandizing him were taken to New York. According to reports , no other state leader who attended the conference had been this megalomaniacal . None of them had brought such printed books of self glorification and self aggrandizement for distribution. Even our own state leaders in the past who attended the conference have not stooped to this cheap megalomaniac conduct – distributing books to glorify themselves. Although the self aggrandizing book about Gamarala was printed at high cost , a large number of these books in bundles were found just thrown about everywhere cheaply in the vehicles, and at all odd places the delegation to New York visited. At least a 1000 books were printed and the cost of each book is Rs. 5000.00 to Rs. 7000.00 which means the entire cost is in the region of Rs. 6 million. (Lake House which printed them owes an explanation to the people in this regard). This is how our simple president simply wastes amply while speaking against corruption , frauds , and profligacy each time he opens his mouth. Bundles of these books were found in the drains of New York allowing the elements to take care–vide video footage herein. After the people were made known about the most corrupt profligate New York junket of the president, and the exposures made with photographs by Lanka e News which is always first with the news and best with the views , Gamarala had gone raving mad. Gamarala who is suffering form acute paranoia has jumped to the conclusion that it is ‘RAW organization that has provided the photos and details to Lanka e News. He had thereafter become suspicious of every Indian guest in the hotels where Gamarala and his jumbo brood were staying. Sirisena and his family were so paranoid they had even stopped their conversations whenever and wherever they saw an Indian national. No sooner they returned to the country than they made a complaint to the CID suspecting the members of the delegation. We have already broken that news under the caption ‘CID entrusted with the task of probing into how Lanka e News received information about the merry making junket.’ The CID had also already begun questioning various officers who went with the president to New York. 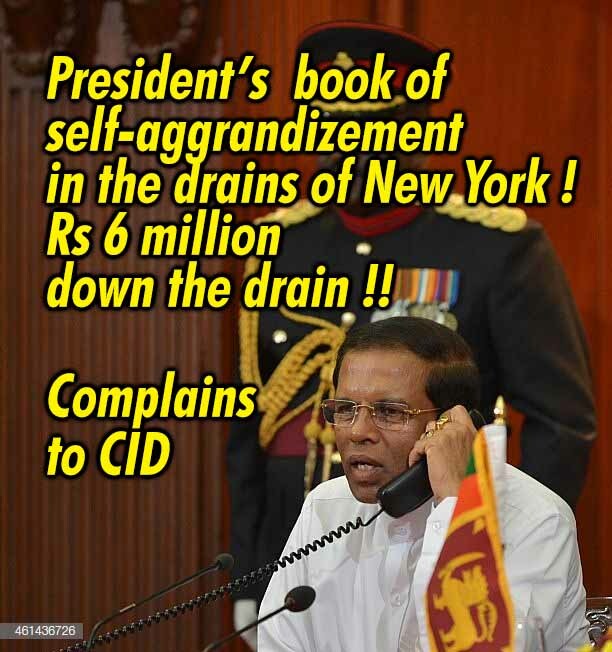 A news website belonging to media secretary of a minister which stoops to any lowliest level to do the sordid biddings of the president reported , the CID had interrogated those who passed ‘sensitive information’ regarding the president to Lanka e News. The harebrained secretaries who reported that , should explain to the nation , how could the news report , taking president’s prospective daughter in law who is to marry president’s ‘tablet junkie ’ on the merry making junket become ‘sensitive news . If the selfie taken within the airport published by Lanka e News is an issue , the CID must question not the outsiders but the son in law , prospective daughter in law and others in the selfie who captured that. It had been alleged, by Lanka e news disclosing the room No. of the hotel in New York where president Gamarala stayed , the Tigers who are in the city of New York have come to know of it , meaning that president’s security was compromised. It is an incontrovertible fact , the world’s best security blanket is provided only to the state leaders who attend the UN conference. Hence the world leaders learning of the room number of a moronic leader like Gamarala has no impact and is of no consequence . If any harm is to befall , it can only be through wheeler dealers who visited Gamarala’s room there. Besides ,it is to be noted , no Tamil national raised protests against Gamarala’s arrival in New York. Under what penal code does publication of photographs of president’s delegation become a crime ? Gamarala instead of giving an answer to that , just suspecting the members of his delegation of his to New York, and tipping off the CID against them , one after another is most deplorable and despicable. No leader before him of this country had ever resorted to this type of obnoxious actions.